Overview : Meet the world’s first photo editor that adapts to your style & skill level. Luminar is the supercharged photo software that makes complex editing easy & enjoyable. Landscape, portrait, wildlife, macro - you name it. Luminar brings filters, layers, masks, color controls, RAW converter and other features that are ready to give your photos the professional treatment they deserve. Quality/Usability : Adobe Lightroom and Apple's Aperture are pretty well known within the photography industry as the go-to source for photo editing. 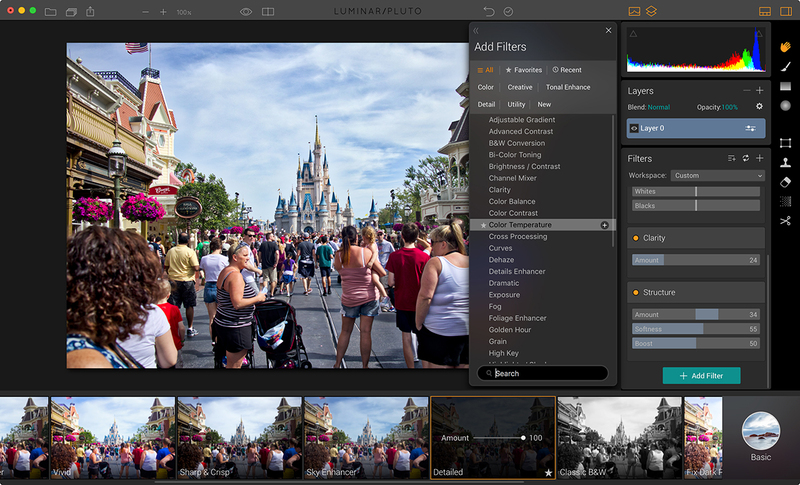 Luminar is Macphun’s latest editing platform, and it’s the company’s first try at an all-in-one solution that can go head-to-head with Adobe Lightroom (Amazon / B&H Photo / Adorama) and Apple’s Aperture programs. On November 17, 2016, it was officially released to the public. But how does it hold up to platforms like Lightroom? Macphun makes software exclusively for Apple Macs, hence the name. 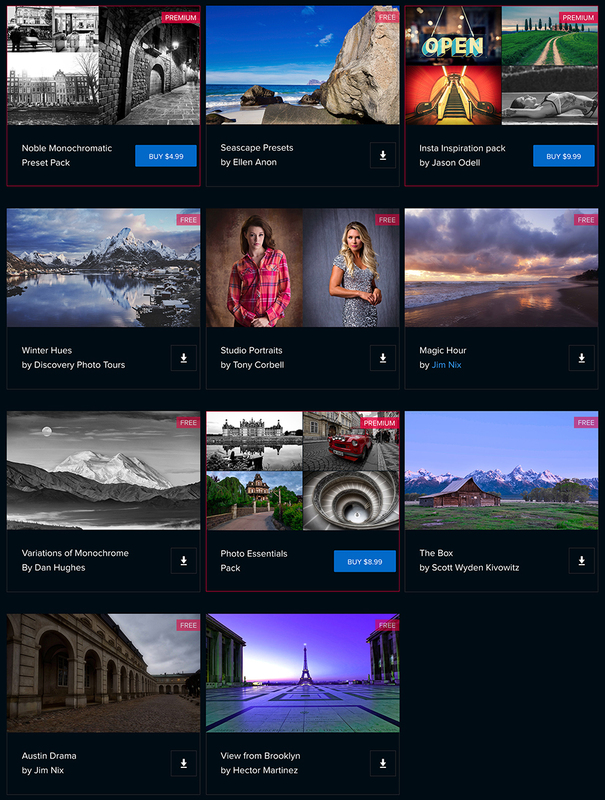 Luminar is "the world's first photo editor that adapts to your style and skill level". Adobe caters to a large part of the image-editing market whether you're a photographer, graphic designer or videographer. We all know that Adobe has Creative Cloud that charges on a monthly basis. Just the Creative Cloud Photography Plan that includes Lightroom and Photoshop is $10/month. 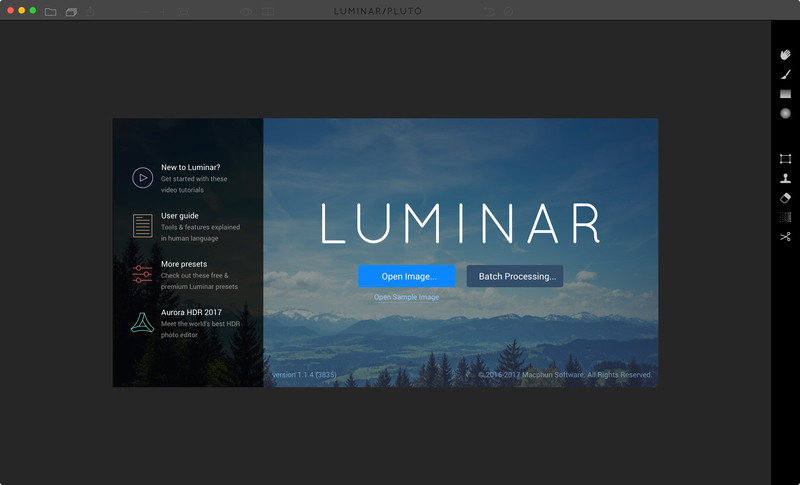 Luminar, on the other hand, requires a one-time purchase of $69 (7 months worth of Adobe CC). Luminar even allows you to do things that Lightroom alone could not do. The tool can be run as standalone software, or used as a plug-in for Photoshop, Lightroom, Photoshop Elements, and Aperture. It also works as an extension to significantly extend the editing features of Photos for Mac...adding back in pro level features that former aperture users have been missing. In order to run the app, you will of course need a Mac. It can run on Core 2 Duo from late 2009 or newer but you’ll get the best results with a newer Mac and newer OS X. It will work on OS X 10.10.5 or newer. A minimum of 4GB of RAM is needed, but the app responds well to more RAM and processor speed. Luminar does not offer image-cataloging like Lightroom's Library module. The program itself is like Lightroom's Develop module. The entire program is like a single-image editor like Photoshop where it requires a one image at a time workflow. 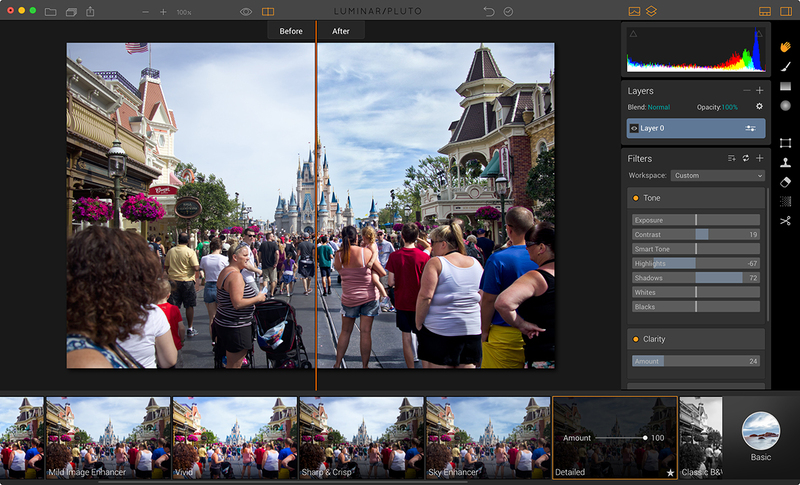 Luminar gives you flexibility in the number and types of edits you can make to your image. Once you open a photo in Luminar, you'll see along the bottom of the screen is a filmstrip displaying different preset image effects. You can choose different categories using a button at the right hand end, for example 'Basic', 'Street', 'Outdoor', 'Portrait'. A single mouseclick will apply one of these preset effects. This will give you a foundation to start from. Then, over on the right hand side of the screen, you can see the adjustments that have been made in a vertical tools panel. You can tweak the settings as much as you like until you get the look you're looking for. Editing an image is very simple, just like other photo editing programs that you're use to using. If you want saturation, just slide the slider to bump up the saturation. 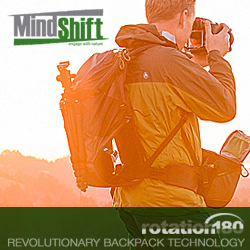 You can adjust highlights, shadows, whites, blacks, exposure — the usual things you would find. 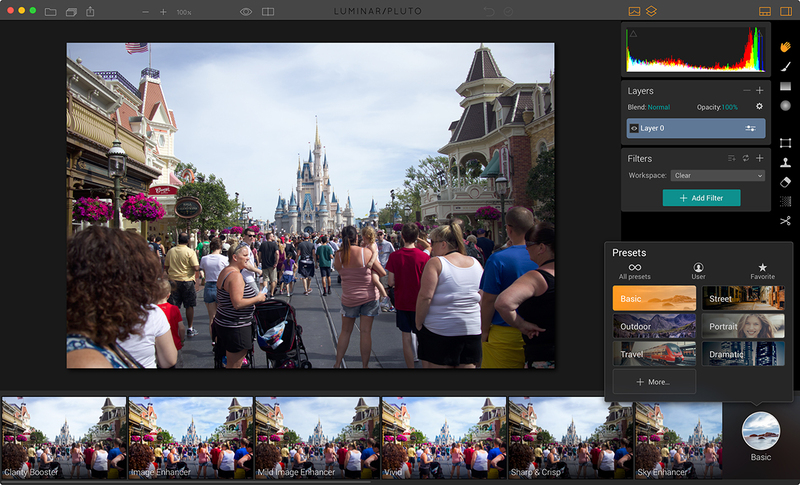 This is where Luminar starts to show off its ‘adaptive interface’, one of its key features. MacPhun says it can adapt to different users and needs with a mix-and-match approach to its image-editing tools. There are 38 different tools, or ‘filters’. These include special effects like ‘Soft Focus’ and ‘Cross Processing’ alongside regular image-enhancement tools like ‘Curves’ and ‘HSL’. You can also do side-by-side comparisons. It is a little harder to see but certain images, you can tell right off the bat. I'm on a 2015 15" Macbook Pro with 16GB of RAM and one thing I did notice is that saving files can take a while especially when you're doing batch processing compared to Lightroom. Even single images can take a little longer. 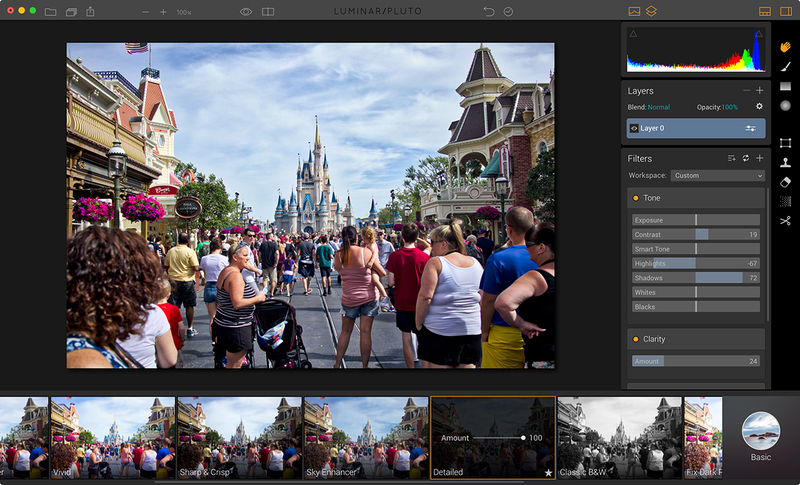 Luminar offers additional presets that you can download for free or pay for premium presets. 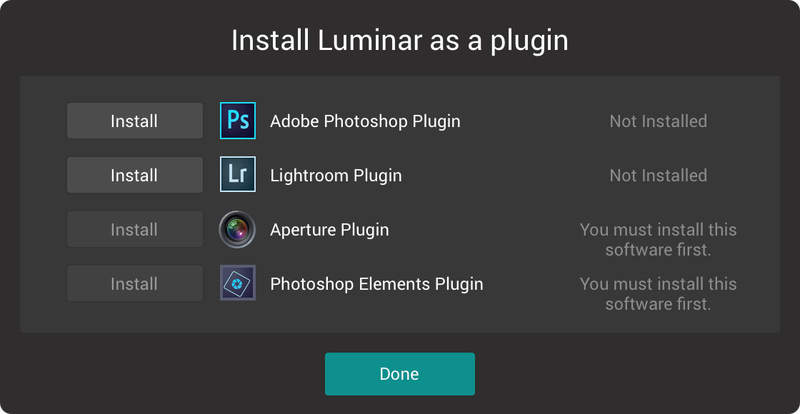 To install them, simply download them from the Luminar Presets page. Once they are downloaded, double-click on the preset and it'll install. Majority of the free or premium presets are just wayyyy out there that I wouldn't be using them at all. It makes the images all too artsy whether it be grunge looking, heavily blurred or overly saturated and contrasty. For the premium presets, Luminar does give you a preview of what some of the presets look like. 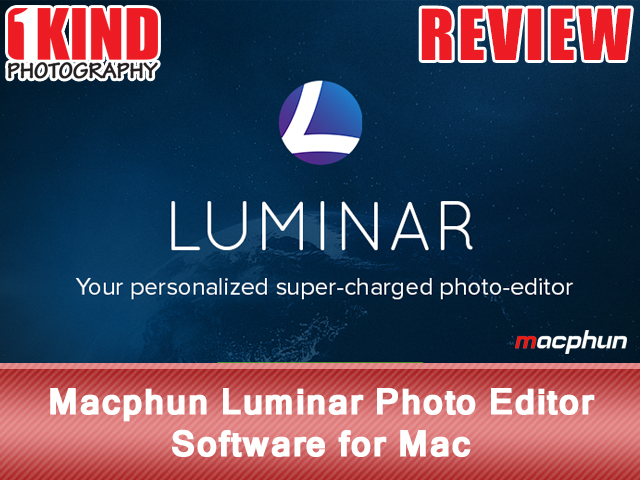 Conclusion : Overall, the Macphun Luminar Photo Editor Software for Mac is a nice standalone program for a very reasonable one-time price. 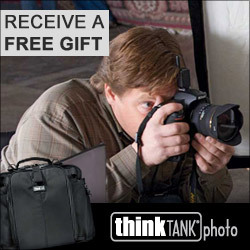 There is no monthly or yearly subscription like Adobe Lightroom. Even though this review is based on the Mac version, as of this review, Macphun released a Windows Beta. With Lightroom, you have to install different presets or make your own where as Luminar is all included. The program gives a huge range of presets to choose from while letting you adjust them to you liking (you can also make your own). Luminar also offers free presets as well as paid premium presets if you're interested in building your preset library.